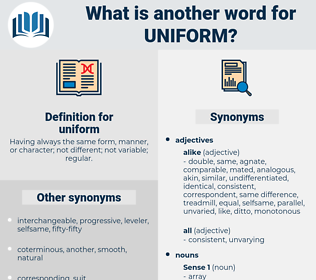 What is another word for uniform? Having always the same form, manner, or character; not different; not variable; regular. unambiguous, identical, reunified, same, harmonious, uneven, inconsistent, undivided, homogenised, similar. servicemen, men, suit, unification, reunification. standardised, homogeneous, one-size-fits-all, cohesive, unified, consistent, standard. 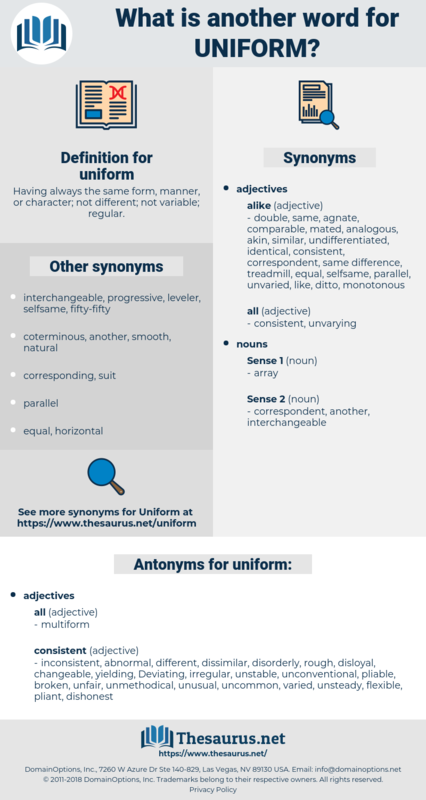 homogeneous, outfit, spacesuit, consistent, standard, standardisation, attire, re-unification, uniforme. inconsistent, abnormal, different, dissimilar, disorderly, rough, disloyal, changeable, yielding, Deviating, irregular, unstable, unconventional, pliable, broken, unfair, unmethodical, unusual, uncommon, varied, unsteady, flexible, pliant, dishonest, inconstant, unsystematic, unlike, soft, varying, untrustworthy, unalike, imbalanced, intermittent, corrupt, unfixed, divergent, uneven, eccentric, wobbly, changing, variable. It is Banks, out of uniform. Now, boys, about turn, and off for your uniform - good day. livery, jump suit, military uniform. Habiliment, wear, clothing, article of clothing, vesture, wearable.